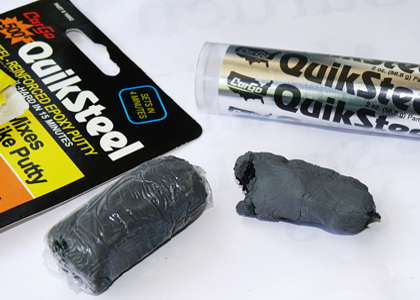 QuikSteel Epoxy Putty Stick is a hand-kneadable, fast-setting, industrial-strength, steel-reinforced polymer compound for permanent repairs to anything made of steel or other metals. QuikSteel has a 3 to 5 minute worklife. Functional cure occurs in 60 minutes. Cured color is steel grey. NSF Certified to Standard 61 by The National Sanitation Foundation for use in contact with drinking water.